Joseph H. Pilates, Clara Pilates and niece, Mary Pilates. "After 10 sessions, you'll FEEL a difference. After 20 sessions, you'll SEE a difference. The study and practice of Pilates has enabled me to overcome back injuries and to engage, not only in normal daily activities, but also in very physical activities such as hiking, backpacking, skiing and helping others to do the same. After injuring my back and practicing traditional physical therapy exercises for several years, I continued to struggle to get out of bed, hobble down the stairs and make it through the day while taking pain medication and/or muscle relaxers. Some days, I just had to give in and lie flat until I was able to move again. On my mother's suggestion, I started practicing some basic Pilates exercises and quickly saw improvement. Joseph Hubertus Pilates was born in 1880 near Düsseldorf, Germany. Small and sickly as a child, he was afflicted with asthma, rickets, and rheumatic fever, and was continually taunted by the bigger children. He quickly became determined to overcome his physical disadvantages and to educate himself in anatomy, bodybuilding, wrestling, yoga, gymnastics, and martial arts. He soon achieved an almost Adonis-like "anatomical ideal," to the extent that at the age of 14 he was posing as a model for anatomy charts. Before World War I, Joe was touring England as a circus performer and professional boxer, and even teaching self-defense to the Scotland Yard police force, but when war broke out, he found himself interned in England as an enemy alien on the Isle of Man. The health conditions in the internment camps were not great, but Pilates insisted that everyone in his cell block participate in daily exercise routines to help maintain both their health. 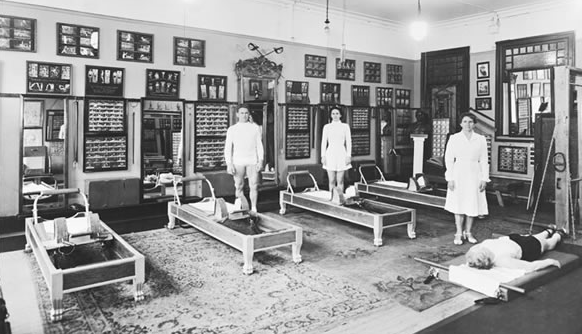 Some of the injured German soldiers were too weak to get out of bed so Pilates took springs from the beds and attached them to the headboards and footboards of the iron bed frames, turning them into equipment that provided a type of resistance exercise for his bedridden "patients”.These mechanized beds were the forerunners of the spring-based exercise machines, such as the Pilates Cadillac and Reformer, for which the Pilates method is known today. Pilates returned to Germany after the war, and his achievements with the German soldiers in the prison camp did not go unnoticed. In 1926, the Kaiser invited him to begin training the German secret police. At this point Pilates, wanting nothing to do with the secret police, decided to emigrate to the United States. He met his future wife and dedicated teaching partner, Clara, on the boat to New York City. Together they opened the first Body Contrology Studio on Eighth Avenue at 56th Street in Manhattan in the same building as the New York City Ballet. For the rest of his life, he continued to develop his exercise system and to create new pieces of equipment for it. Now we can find Pilates studios all over the world. Joseph Pilates truly was a man ahead of his time. Today, many famous athletes, dancers, models, and actors — as well as business professionals, housewives, and retirees — are improving their lives with Pilates. Following are links to articles you may find interesting. Click on blue article title for direct link or on the link to the right of the title for a printable Adobe pdf file. Balanced Body Pilates. Information and links to more articles.